A teenager punched a police officer and chased him down South Street, only stopping when he was about to be tasered, a court heard today. Tyson Savage, 18, had reacted angrily to police handling of another matter nearby, the court was told. 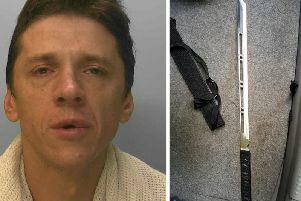 He was convicted of assaulting a police officer and obstructing an officer in the execution of their duty at Worthing Magistrates’ Court this morning. On May 6 this year, Chichester-based officers PC Max Hoare and PC Molly O’Malley were called to Chichester Cross about 3.10am. Savage, who lives in Morants Close in the city, became angry and kept opening the rear door of their police car. Prosecutor David Packer said: “At this point Mr Savage swung a punch towards PC Hoare. At this point PC Hoare drew his captor spray and – after giving Savage a shouted warning – aimed the spray at his face. PC Hoare told the court the spray missed Savage’s face. Covering his eyes to avoid more captor spray, the teenager then began to chase PC Hoare down the street. Giving evidence by videolink, PC Hoare told the court: “I believed he had been drinking. I could smell liquor on his breath. “My main concern was he was going to assault me again. “I turned and ran as fast as I could down South Street. Savage immediately became compliant and was arrested, the court heard. The prosecutor said Savage ‘wilfully obstructed’ PC Hoare’s colleague PC Molly O’Malley and put PC Hoare himself ‘in fear for his safety’. Savage was not present in court and the trial proceeded without him, but he was represented by solicitor David Bathurst. Mr Bathurst said: “There do appear to be some inconsistencies between the evidence of the officers. But magistrate Andy Du Port said the panel found both officers to be ‘clear and convincing witnesses’. Savage was found guilty of assaulting PC Hoare and obstructing PC O’Malley. The case was adjourned and he will be sentenced at a later date.